Hannah Proctor looks afresh at an important post-war Sovietological study and uncovers the surprising ways that assumptions about totalitarianism structured social scientific research. In 1950 a team of social scientists from Harvard University arrived in West Germany to begin a nine-month period of intense interviews with displaced persons from the Soviet Union. The Harvard Project on the Soviet Social System (HPSSS) produced hundreds of lengthy interview transcripts, which were digitised by Harvard University in 2005-2006 and are available to explore online. Esoteric, subjective and anecdotal, the materials generated by the project provide glimpses into the experiences and attitudes of ordinary Soviet people and remain a valuable resource for social historians. I have used the searchable database to gain an insight into such diverse subjects as opinions of Trotsky, experiences of bread shortages, theatrical repertoires, housing conditions in Leningrad, cinema-going habits, Ukrainian nationalist sentiment, Islam in the Soviet Union and attitudes to abortion. However, the transcripts should not be treated as transparent portals into the social history of the Soviet Union. The HPSSS was commissioned at a moment when the Cold War was beginning to take shape as a battle of ideologies, and it participated in the US state’s attempt to understand (and defeat) the communist ‘enemy’. Thus for historians of psychology, and scholars interested in the history of ‘brainwashing’, a primary interest in these materials lies in what the transcripts reveal about the methodologies, assumptions and conclusions of the American interlocutors. A closer look at the origins of the HPSSS, its outcome and its protocols reveals tensions between researchers’ desire to pursue rigorous social science and the demands of their patrons in the US Air Force and CIA. It also suggests a pervading belief – present throughout the project’s transcripts and publications – that Soviet citizens, like their state, were prone to deception and difficult for Americans to comprehend. The Harvard Project on the Soviet Social System (HPSSS) was commissioned by the US Air Force in 1950. Though the project drew its top personnel from Harvard, much of the project was conducted at the CIA-funded Munich Institute for the Study of the USSR. The project’s relevance to American national security was obvious to its government patrons: five years after the end of the Second World War relations between the former allies were strained. President Harry S. Truman had vowed to ‘contain’ the Soviet threat and promoted a confrontational approach to world affairs. 1950 also saw American troops intervene in the Korean War. Indeed, later that year Americans would be introduced to the term “brainwashing” as a way to explain the sudden conversion of Chinese citizens to Communism, and to retroactively make sense of the strange spectacles of the Soviet show trials. Sociologist Alex Inkeles and psychologist Raymond Bauer led the project. Its twin goals were to glean information in order to build a ‘working model’ of the Soviet system and to conduct psychological assessments to determine the extent to which Soviet people had adapted to the regime. They devised detailed sets of interview questions that sought to uncover the minutiae of Soviet social structures, practices and outlooks, covering everything from labour to clothing, news sources to leisure activities, living arrangements to views on particular political figures. However, the goals of these left-leaning academics, who had themselves faced intense questioning over their political sympathies before obtaining security permissions, did not always accord with those of the US Air Force. They were under constant pressure to give more priority to military intelligence gathering – as if the interviews with Soviet citizens were also interrogations. A closer look at the origins of the HPSSS, its outcome and its protocols reveals tensions between researchers’ desire to pursue rigorous social science and the demands of their patrons in the US Air Force and CIA. It also suggests a pervading belief – present throughout the project’s transcripts and publications – that Soviet citizens, like their state, were prone to deception and difficult for Americans to comprehend. Post-war political circumstances complicated the project’s interviews as well as creating the possibility for them to take place. Interviewees were either people displaced by the Second World War (including former POWs and labourers) or members of Soviet occupying forces who had fled from the Soviet controlled sectors of Germany and Austria and avoided repatriation. In 1950 most of the interviewees were living in camps for displaced persons, where members of the HPSSS team went to seek out recruits. 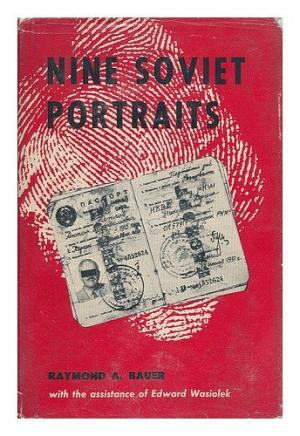 Participants volunteered to be interviewed, were paid for their participation and were guaranteed anonymity, indeed the HPSSS researchers believed this was necessary in order to stave off rumours that the psychologists were either Soviet agents or US immigration officials. The HPSSS team were well aware of the limitations of their sample, which was by no means representative of Soviet society. Men far outnumbered women among interviewees, and people from the western republics of the USSR far outnumbered those from the East. 93% of respondents were Slavic – classified into three groups as ‘Great Russian’, Ukrainian and Belorussian – and only a small number of interviews were conducted with people from different ethnic groups or from Central Asian and Caucasian Soviet Republics. Furthermore, there were concerns that the people they interviewed were more likely to express hostility towards the Soviet regime and communist ideas than people who had chosen to return. Despite these acknowledged limitations, these interviews were nonetheless believed to be the best way to gather crucial information about the seemingly opaque and inaccessible Soviet social system. The sheer quantity of empirical material the HPSSS generated far exceeded that of any contemporaneous investigation. Just under 700 interviews were conducted in Munich and a further 100 in New York; thousands of questionnaires were also collated and all these materials eventually filled more than 100 file drawers. The transcribed interviews subsequently went on to form the basis of a large number of monographs and articles authored by the interviewers, and by 1960 at least 50 publications based on the project had appeared. Despite the variety of people interviewed and the divergent perspectives expressed and recorded in the transcripts, this huge cache of material was used by the social scientists as the basis for making broad, generalising conclusions about Soviet dispositions and attitudes. Such interpretative publications, which participated in shaping Cold War stereotypes of Soviet people, also provide insights into their authors’ own dispositions and attitudes. For example, a co-authored article from 1958 drew comparisons between Soviet and American people concluding that Soviet people were more likely to display fear, despair, passivity and depression than their American counterparts. Ironically, this generalising article concluded that Soviet people were exceptional in their propensity for drawing grandiose generalisations. Bauer’s Nine Soviet Portraits (1955) was one of its major publications, though strangely it was a partly fictionalised study, abstracting from various interviews in order to construct nine archetypal figures (the female collective farm worker, the urban housewife, the young male tractor driver etc). Central to Bauer’s thesis is his insistence on the ‘artifice’ integral to Soviet society (by which he usually means a proclivity for lying), yet he does not reflect on the relation between this apparently distinctly Soviet trait and the form in which he chose to present his scientific findings. Such interpretative publications, which participated in shaping Cold War stereotypes of Soviet people, also provide insights into their authors’ own dispositions and attitudes. Reflecting on the project years later, Alex Inkeles’ National Character: A Psycho-Social Perspective (1997) concluded that ‘there was a high degree of incongruence between the central personality modes and dispositions of many Russians and some essential aspects of the structure of Soviet society’, suggesting that the stark distinction between the promises of Soviet ideology and the harsh realities of Soviet life meant that Soviet people in the immediate post-war period were critical of the regime despite their inability to challenge it in practice. Inkeles asserted that Soviet people retained a degree of subjective autonomy even during the most repressive years of the regime, an argument at odds with dominant Cold War-era characterisations of the Stalinist subject as a passive automaton (though certainly consistent with prevalent Western liberal understandings of human nature). 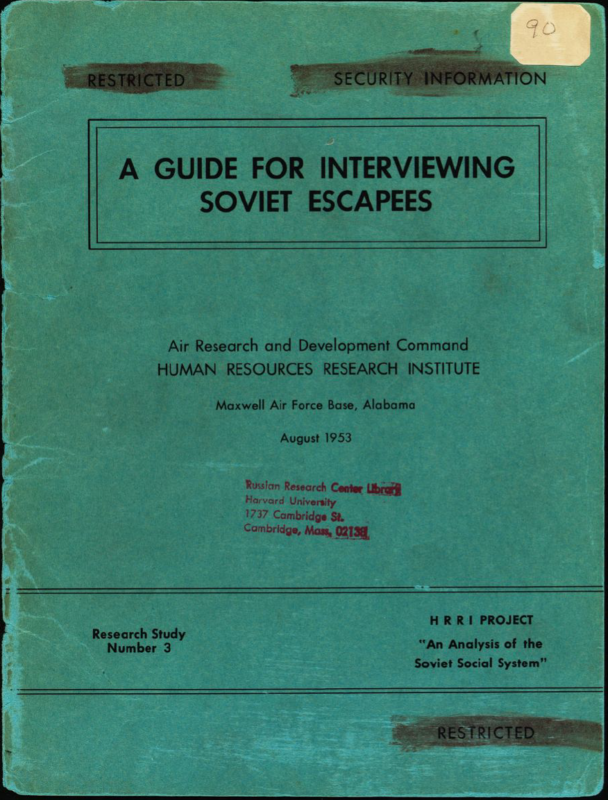 A document produced after the Munich interviews, Guide for Interviewing Soviet Escapees, is a useful starting place for thinking about how the perspective and prejudices of the interviewers influenced how they gathered data and interacted with interview subjects. Written after the interviews in Munich had been completed and intended to provide advice for social scientists conducting similar experiments, the guide reflects on the cultural barriers the Americans came up against and offers sweeping conclusions about the Soviet personality. The guide characterises Soviet people as ‘masters in the art of lying’ motivated by guilt, a ‘high level of anxiety’ and a desire for approval: ‘they may distort their answers in order to tell Americans what they think Americans want to hear’. A list of sometimes contradictory fears common in Soviet interviewees are listed which range from rational concerns that admitting membership of the Communist Party might be risky for those hoping to emigrate to the USA to anxieties rooted in superstition: ‘FEAR of the end of the world (Stalin as anti-Christ).’ Soviet people are represented as being inherently contradictory, combining the garrulous traits of the ‘traditional Russian’ with the reticence and mistrustfulness said to have been ushered in by the revolution. 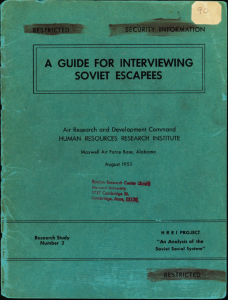 Guide for Interviewing Soviet Escapees by Alice H. Bauer, Russian Research Center. Davis Center Collection, H.C. Fung Library, Harvard University. Knowledge of the Soviet system is given as one of the most successful ways of protecting against such emotional ‘disturbances’. Yet gaining knowledge about the Soviet system was precisely the intention of the interviews, rather than mastering an existing body of knowledge in advance. The guide characterises Soviet people as ‘masters in the art of lying’ motivated by guilt, a ‘high level of anxiety’ and a desire for approval: ‘they may distort their answers in order to tell Americans what they think Americans want to hear’. Reading the guidance document alongside the interview transcripts might provide insights into the ways in which American constructions of the Soviet enemy were shaped by anxieties and assumptions about totalitarianism. It’s important to note that the transcripts themselves are not verbatim records but were based on notes taken during the interviews and comments recorded into a tape recorder immediately afterwards which were subsequently typed up in English by West German secretaries (with a smattering of inconsistently transliterated Russian terms). The transcripts frequently skate over or summarise responses deemed superfluous or excessively verbose and often include interjections by the interviewer indicating their frustration with the interviewee for ‘digressing’. Such decisions not to take note of everything said indicate that the interviewers allowed their assumptions about what constituted relevant material to take precedence over factors prioritised by their interview subjects. Perhaps it might nonetheless be possible to discern moments in which the Soviet people being interviewed contradicted the assumptions of the HPSSS team about what kinds of subjects Stalinism produced. The Harvard Project on the Soviet Social System presents mediated portraits of Soviet people who were presumed to have mindsets determined by their nationality. Today it might be most interesting for the telling glimpses it provides into the mindsets of the social scientists on the other side of the iron curtain who participated in shaping and sustaining those presumptions. Hannah Proctor’s work probes the relationship between political ideologies and the ‘psy’ disciplines. She recently completed a PhD on the Soviet psychologist and neurologist Alexander Luria at Birkbeck, where she is currently ISSF Wellcome Trust Postdoctoral Research Fellow.